USA (Women’s Classes) -- Using Dr. Wagner’s book, The Sensation of Being Somebody, CMM board member, Terri Benedix, teaches classes for women on the Central Coast of California. To those confronted with life-threatening diseases, she provides encouragement and training which emphasizes the motivating power of our new nature in Christ. USA (Prisons) -- Chaplains in Michigan and North Carolina are using Dr. Wagner’s books, provided at no cost or at reduced prices subsidized by CMM, to lead inmates to faith in Christ and on to Christian maturity. Believing prisoners now are ministering directly with other inmates because of this training. Many have expressed surprise that God is not at all like their earthly, abusive parents. Thus, their relationships with Jesus are taking on new joy and are bringing about real rehabilitation. UGANDA -- CMM has provided printing facilities for Cornerstone Vocational Institute, located in Kampala and directed by Dr. James Butare of Wycliffe Bible Translators Australia. At CVI, young people, mostly orphaned by AIDS, will be trained in printing, sewing, and carpentry. 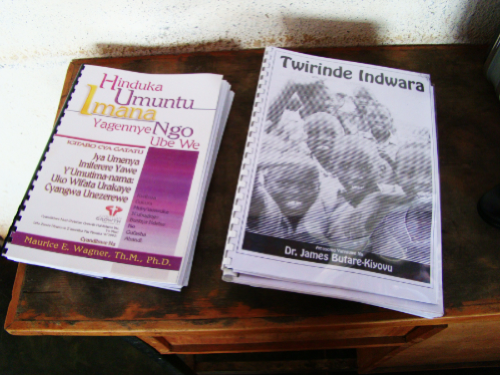 Dr. Butare also oversees the translation of Dr. Wagner's four-volume series, Become the Person God Meant You to Be, into his native language, Kinyarwanda. In Kampala, the translator, John Mitubishu, supported by donations from CMM, has finished translating the first three volumes and now is working on the fourth. SINGAPORE-- For the last two years, CMM has provided subsidized copies of The Sensation of Being Somebody to the Singapore Bible College, where the books are used as texts in classes on Biblical counseling.